It's taken a few blogs to get to the actual contents of the notebook referenced at Josef's court martial, but I think it's been a necessary preamble. Josef apparently hadn't seen the notebook since he left The Hague and it wasn't included in any of his lists of possessions drawn up by the Ramsey Police and MI5. Even the interrogators at Camp 020 only heard about it through Josef on June 23, 1941. There are a lot of questions surrounding the inclusion of this notebook as evidence at Josef's court martial. Tracking the Notebook - Where did the notebook come from as it does not appear on any of the detailed lists that itemized the articles found on Josef? Camp 020 Interrogations - Why was Josef never interrogated about the times/dates/locations for covert "assignations" during his many months at Camp 020? Contents of Notebook - What was actually written in the notebook and were the three locales (Zoological Gardens, Derby Station, Oxford Street and Edgar Road) actually in London? Assignation Candidates - Who might have shown up at those dates/times/locations to rendezvous with Josef? According to the court martial transcript, Josef was shown the notebook at the court martial during a conversation around him receiving additional funds from other agents. The notebook just seems to appear in Josef's hands and the preceding transcript page does not document how it was brought into the discussion and presented to Josef. Q. How would you let the Germans know you wanted money? A. By wireless. I have it here (referring to the document which is to be found inside the wallet, Exhibit 8). "Zoological Gardens at 2 o'clock either on the 2nd or the 16th of the month. Derby Station waiting room on the 3rd or 17th of the month". Q. Which month is that? A. They told me when I needed money the three points where I could join men and they will give me money when I have given notice I needed it. There was the 2nd or 16th of any month. Q. In the Zoological Gardens? A. Yes, and the 3rd and the 17th of the month in the waiting room of the station at Derby, and the 1st and 15th of the month at the corner of Oxford Street and Edgar Road." Q. What day was that? A. The 1st and 15th. Q. When did you write it? A. At the Hague before I started. Q. And you put it into your pocket book? Derby Station waiting room - 3rd and 17th of the month - same time? Oxford Street & Edgar Road - 1st and 15th of the month - same time? These seem to be very clear but what we see in the notebook is a pale shadow of Josef's certainty. There is only one page (the first page) within the notebook that has any writing on it. Page with writing from small notebook entered as Exhibit 8 at the court martial of Josef Jakobs, with annotations (updated). The boxes highlighted in blue contain what seem to be telephone numbers. More on them later. The boxes highlighted in black are mysterious annotations with no obvious interpretation. The two boxes in red contain the most interesting notes. The first line would seem to correlate with Josef's statement that one of the assignations was scheduled for the Zoological Gardens on the 2nd and 16th of the month. The "u." between the two numbers is most likely an abbreviation of "und", the German word for "and". The second line is perplexing. In the court martial, Josef said one of the locations was Derby Station waiting room on the 3rd and 17th of the month. Knowing the German predilection for placing "Station" before the descriptor, we could see it as "Station P.R.". But I am not sure how Josef created Derby out of the initials P.R. It definitely looks like a "P" and not a "D". So even if he had been writing in code and meant to write "St. D.R." with "D.R. being an abbreviation for Derby, the letter does not look like a "D". I see nothing on the page that would reference Oxford Street and Edgar Road, nor the 1st and 15th of the month. Nor do I see any reference to a time for the assignations - no mention of 2 o'clock anywhere. One of the obvious questions is... were these actual locations in London? Zoological Gardens would seem to be an obvious reference to the London Zoo. Apparently it was referred to as the Zoological Gardens in the past. This seem a rather vague location within which to meet an apparent stranger, unless, of course, there was some sort of gesture or conversation with which Josef and the unknown other could recognize each other. The fact that the Zoological Gardens were closed at various points during the war during bombings might also have played havoc with meeting times and dates. The second location reference in Josef's notebook is: "St. P.R.". He said that the dates associated with this note were for meetings at the Derby Station waiting room. The only Derby Station I have come across is the railway station located in the city of Derby in Derbyshire, just over 100 miles north-northwest of London (near Nottingham). Given that the other two locations were in London, it seems rather farfetched for a meeting location to be that far outside of London. A couple of possibilities present themselves. Perhaps the interpreter misheard what Josef spoke and he didn't actually say "Derby" but some other word (Darby?). Another possibility is that Josef's memory was faulty and that he had forgotten what "St. P.R." stood for and grabbed a word out of thin air. The more interesting question is: What could "St. P.R." stand for in London? Is there a Station Park Regent? The Zoological Gardens is located within Regent's Park, which, interestingly enough has the initials "R.P. ", rather similar to the "P.R." Perhaps the letters are backwards and should be read as "R.P. St."? In which case we might have Regent's Park Station. Or perhaps Ravenscourt Park Station, although this seems unlikely given its distance from Central London. So, perhaps it was "Regent's Park Station"? The last location Josef referenced was the "corner of Oxford Street and Edgar Road". Oxford Street is easy. Edgar Road is more of a problem. The only Edgar Road in London is in the east, in the Tower Hamlets area. This seems like another unlikely meeting place. On the other hand, for a German who is not familiar with strange-sounding British names, Edgware Road could be easily heard or remembered as Edgar Road. And, there is indeed an intersection of Oxford Street and Edgware Road, near Marble Arch. Map of London with possible locations for assignations (blue) and address of Frau Lily Knips (green). All three of these possible locations (Zoological Gardens, Regent's Park Station, Oxford Street & Edgware Road) are in relatively close proximity to each other. They are also relatively close to 9 Compayne Gardens, the address for Frau Lily Knips, the Jewish refugee whom Josef had known in Berlin. During his initial interrogations, Josef had stated that he hoped to meet with Frau Knips and solicit her assistance. It would then make sense that the meeting locations would be in the general vicinity of Frau Knips' address. "Asked the address of the Dienststelle at Hamburg, JAKOBS said it was in General Knochenhauerstrasse and he believed the telephone number to be 221692. When he asked for this number, the reply was "Generalkommando", and he then asked for Dr. Beier. 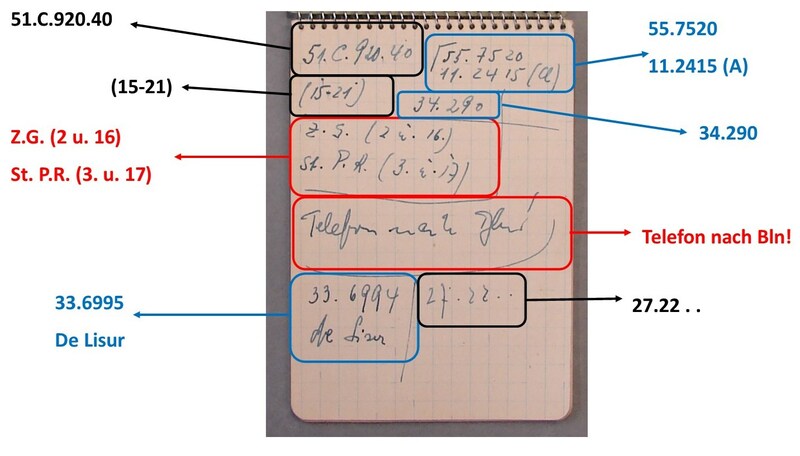 JAKOBS stated that MALTEN gave him the telephone number of the Diesnststelle [Abwehr office] at The Hague, and he said that he believed he had put it down in a small notebook that he brought with him." (June 23, 1941, interrogation at Camp 020). He said this was a small note block, which he thought was in his wallet together with the identity cards, etc. In addition to the telephone number of the Hague Dienststelle [Abwehr office], he had also noted some (?) private particulars regarding questions which his wife had asked him in letters. He strenuously denied having destroyed this block and said that if it was not amongst his possessions, he must have put it by mistake in the suitcase which he left behind at the Hague." (June 24, 1941, interrogation at Camp 020). I have yet to track down a 1940 telephone directory from The Hague or Hamburg and it would seem unlikely that the Abwehr offices would be listed within it. On the other hand, the format noted below is similar to phone numbers of the time. For instance, Josef's mother's phone number was 92 70 65 and his sister's number was 59 07 04. This six digit format is identical with Josef's notes. None of the numbers, however, match Josef's recollection of the Abwehr's phone number in Hamburg - 22 16 92 (June 23, 1941, interrogation). Although... the notation 11.2415 seems to have an "A" behind it which could reference "Abwehr". It is possible that some of the other agents (TATE, SUMMER, Richter) had better memories than Josef and we might find references to Abwehr telephone numbers in their files. Which leads us to the last question around this notebook: If Josef had shown up at these times/dates/locations, who might have met him? Stay tuned for the next blog. Thanks to Traugott Vitz and Keith for their contributions to solving the mystery!